As a kid, I used to watch the Rocky and Bullwinkle show. One segment of the show included a boy and his dog (or was it the other way around), named Mr. Peabody and Sherman, who used The Wayback Machine to travel back in time and learn about history. There's a website - http://www.archive.org/web/web.php - called The Internet Archive Wayback Machine, that allows us to do the same thing - sort of. Created by Internet search engine Alexa, The Internet Archive Wayback Machine enables you to explore an archive of 85 billion web pages from 1996 to a few months ago. To try out the service, I typed in the URL for my college. 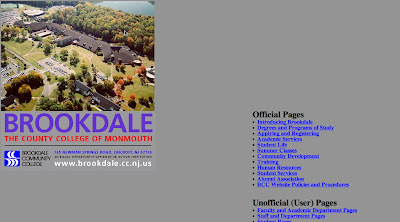 To get as far back as I could, I used an older URL www.brookdale.cc.nj.us - which still points to the new URL www.brookdalecc.edu (circa 2002). The result below shows the archived copies of the webpage available from 1997 to late 2006. It's interesting to look at the evolution of the web and webpages over time. Here is the oldest version available, from April 10, 1997. Amazing that this is almost exactly 10 years ago! Pretty much what you'd expect from that era - nothing fancy, dynamic or interactive. 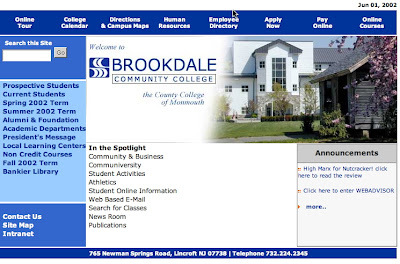 The site was redesigned in 2002. Here is the result from June 1, 2002. Does it look familiar? Could time really be standing still? the rest will observe (lurkers!). As you build your communities, keep these percentages in mind - just because someone's not participating doesn't mean they don't benefit. 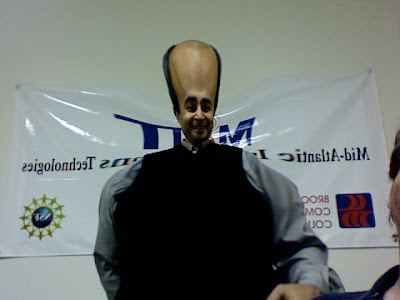 This photo of my colleague Mohammad Shanehsaz was created from an application call Photo Booth, available out-of-the-box on any Apple computer. The 10 minutes Mohammad and I spent playing with Photo Booth got us to thinking "How could we use this in the classroom?" It came to use at the same instant - an icebreaker. An icebreaker is a simple activity or exercise that helps to break down the student-teacher and student-student barriers. Breaking down these barriers is critical to engaging students and providing for a rich, dynamic learning environment. Here's the idea - First day of class, show up with a Mac laptop and a projector. In addition to the routine discussion of syllabus, grading policy, contact info and on and on ... have each student come to the front of the class and capture their likeness in Photo Booth - with you and the rest of the class watching and participating. Limit how long they have, but encourage them to explore the right side of their brain and create an "interesting" image. 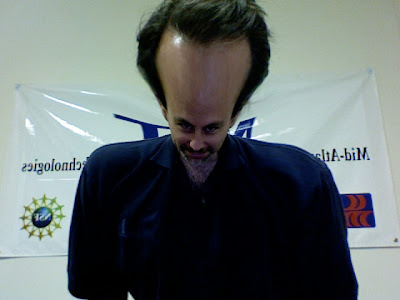 What you end up with is funny photos of each of your students, that will help you to remember their names (e.g. a semester seating chart) and help your student begin building a community. I'll be posting this week from the Cellular and Telecommunications Industry Association (CTIA) WIRELESS 2007 in Orlando, FL. I'm here attending as one of two recipients of the Global Wireless Education Consortium's (GWEC) 2007 Wireless Educator of the Year. I share this award with Dr. Moe Z. Win from the Massachusetts Institute of Technology. It's quite an honor to be included in such prestigious company, including Moe and winners from prior years. I have to give thanks to the many colleagues who have made this award possible, in particular Gordon F. Snyder, Jr., Executive Director of the National Center for Telecommunications Technologies at Springfield Technical and Community College and Mohammad Shanehsaz at my college. This week, I'll be sharing my regular thoughts on teaching, learning and technology as well as some highlights from this conference. In our last post we discussed Jeff Han's TED 2006 Multi-Touch interface presentation. Jeff was invited to present again at TED 2007, which finished up on March 10th. Watch the following video to see the progress made since early 2006. The upcoming (June 2007) Apple iPhone also uses multi-touch technology. Let's look at the evolution of boards - of course, we started with chalkboards - major innovations include going from gray boards to green and low-dust chalk. More recent innovations have been the whiteboard, low-odor markers and the smartboard. Although the smartboards are pretty impressive, they still haven't dramatically changed they way most of us interact with our students - or the students with each other. 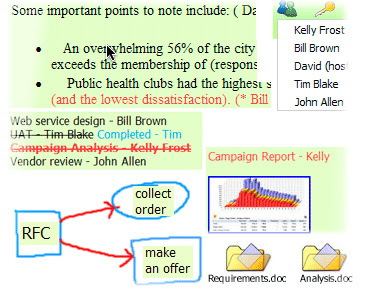 Both of these free services allow users to share an online whiteboard and collaborate. Even more revolutionary is what you'll see in the following video from the 2006 Technology, Entertainment, and Design (TED) conference. This February 2006 video shows NYU researcher Jeff Han demonstrating a multi-touch interface his research group has been developing. As you watch the video, imagine how this technology might change the way humans interact with machines - even better, imagine that this was your whiteboard! and they've begun selling them - mostly to the CIA and Defense Department. TED is a four-day conference in Monterey, California where 50 invited speakers give 18 minute presentations. At a whopping $6,000 a pop, TED tickets are hard to come by - in spite of that the 2008 conference is already sold-out. Though it's unlikely you or I could ever go to TED, we can share in the experience. At you can view and download videos of the talks. Take some time and explore the site - there's a lot of great stuff there! I saw this image at one of my favorite blogs - Guy Kawasaki's How to Change the World. It's a picture of a book he's reading called Founders at Work: Stories of Startups’ Early Days - the post-its at the top are material for his next book, and on the side material for his blog. 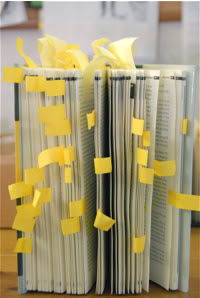 This image brought to the surface something that I've been thinking of quite a bit - students and textbooks. As a full-time teacher, I hear this refrain all the time - "my students don't read" - I even have a colleague who adopts textbooks based on their thickness - at least that's one of the criteria. His reasoning - a book that's four inches thick is gonna scare off students - unfortunately I've seen it happen, so there's some truth to his statement. So what are we to do? Do we give in to this apathy and abandon paper books in favor of e-books? Do we move to audio, video and other multimedia? Many of us are already doing that with podcasting and vodcasting (video) and other new learning technologies. Unfortunately, it's not that simple. As someone who is tethered to his computer and starts to suffer withdrawal when I can't check my email, let me be the first to say that I love books. I still have every book I ever had as a student - even the dreaded "Brain and Behavior." At home, I have a stack of books waiting to be read and a book that I am currently reading. In spite of all of that, I read over a dozen blogs regularly, I listen to a number of podcasts and I watch a ton of video on my laptop, including video podcasts, TV shows I missed - even a new web-based TV service called Joost (pronounced juiced) that I'm beta-testing. So what's this all mean? It doesn't mean that students can't read or won't read - it means that they don't read - primarily because they're not engaged. Karl Kapp, in his upcoming book Gadgets, Games and Gizmos for Learning: Tools and Techniques for Transferring Know-How from Boomers to Gamers observes that today's students need - even crave - more stimuli - much more stimuli than we currently provide tehm. So the solution is not to replace books with audio, video and multimedia, but instead to provide students with a much more rich environment, which includes all of the above. Engage them and they will want to read! I leave you with an example that does just that! 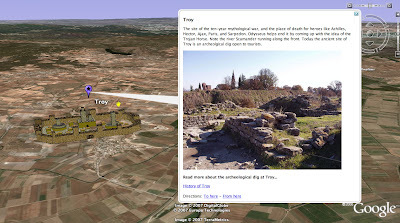 - GoogleLit Trips - a "mash-up," created by teachers Jerome Burg and Matthew Hart, that combines Google Earth with classic literature. Have you read Homer's The Odyssey? I have, but it wasn't easy - it's a tough book to get through, even for the most ardent reader. One of the most difficult things for me was to visualize and contextualize the story. 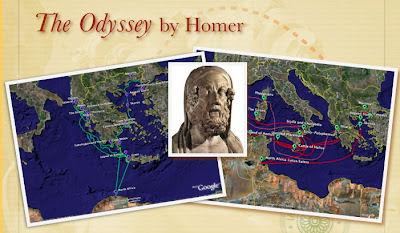 That's where GoogleLit Trips comes in - with GoogleLit Trips students can view and follow a three-dimensional version of the journeys made by Odysseus. Other "trips" available include The Grapes of Wrath, Candide, Macbeth, and The Aeneid. The books don't become any easier to read, but as we begin to build a more rich environment, we increase student engagement, excitement and ultimately understanding.